In my Daily Missal, the readings for this Sunday is prefaced by a short reflection from Pope Benedict XVI, which provides a beautiful introduction and context for situating and understanding’s today’s texts. He proposes this question, “What does ‘entering Lent’ mean?”, then proceeds to answer it in this way – “It means we enter a season of special commitment to the spiritual battle to oppose the evil present in the world, in each one of us and around us.” The battle does not begin today. In fact, the story of the Bible is the story of man’s spiritual battle. In the first book, we encounter the mother of all temptation, the story of Adam and Eve. It’s a story of how power and authority, marvellous gifts from God, are subverted by man’s insatiable ambition and greed and becomes his downfall. In fact, mastery or autonomy is God’s greatest gift to man. Adam seemingly had it made in Eden. God gave him dominion over creation. He named the animals symbolising his charge over them. Though such authority is a gift from God, it is something that man can never hope to possess, only participate in. Man’s exercise of authority is totally dependent upon his submission to God. But once we seek to possess it as our own whereby to exercise God’s authority as our own, that power becomes devoid of God’s redemptive power. At best it can preserve society (like a good police force), at worst it becomes distorted into vicious human coercion. And so, this was the real problem of Adam and Eve - they attempted to usurp God’s power as their own. Man took the gift as a right to be independent, to be in charge of his own life, a master of his own fate. It’s just power gone bad - the result of sin. What would have gotten into Adam and Eve to fall into the snare of Satan? They had everything. They were literally in Paradise. The answer will help us understand the dynamics and the anatomy of all temptations. 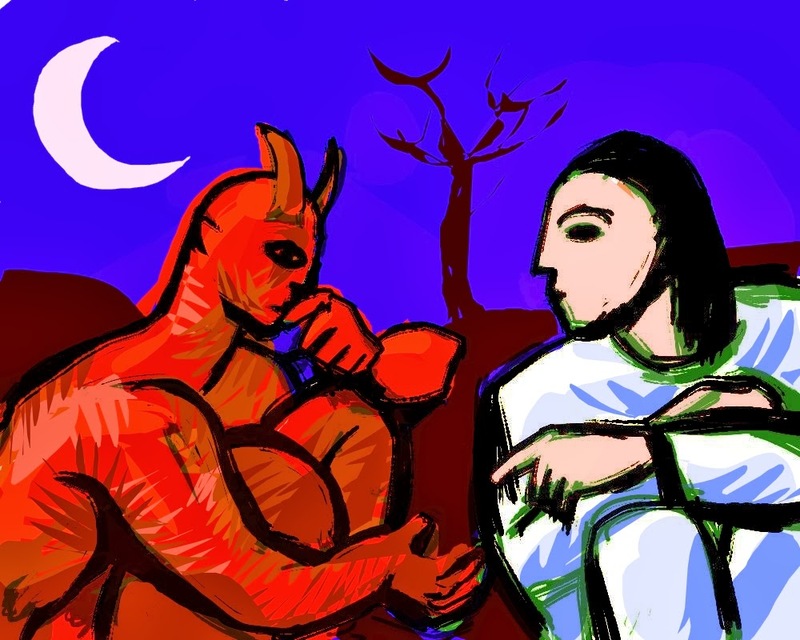 We often think that we can outsmart the Devil by assuming his next move – he tempts us with bad things, right? But the real truth is that Satan is too subtle for that – he always proposes things to us which appear to be good. As St Ignatius of Loyola reminds us, the devil comes cloaked as the Angel of Light, radiant, beautiful and tempting! He does not tempt us to evident evil but to apparent good. The first temptation, therefore, was not openly to disobey God. That would be too crass, though accurate. The devil always sugarcoats prospective sin as something good. Satan proposed a notion that would fit snugly with the drive of man to mastery, to independence, to be in charge. He promised that if Eve and Adam would eat of the tree of knowledge that they would be ‘like gods,’ knowing good and evil. What could be better than that? Today this proposal is still the mother of temptations, to be as gods, to decide for ourselves what is right and wrong. It is still the basic temptation in the world today, the temptation to reject God’s norms of right and wrong, norms implanted in human nature and in creation, the temptation to reject divine authority, either direct, or mediated through the magisterial church, and become like gods ourselves. Dissent is never an excuse that one has to think creatively. It is the product of hubris, the arrogance of man who thinks that he is smarter than God and the Church which Christ had established to provide us clear guidance and direction. Thus, to submit to the will of God, to be obedient to his voice and to listen to the tender counsel of Mother Church, is not stupidity as many would wish us to think. In fact, to resist the temptation to be gods calls for the virtues of courage and humility. We may think we know how hard it is to resist social pressure, the fear of not belonging, but without doubt we underestimate its power. It is very hard to go against social custom. We don’t want to be seen as oddballs, as religious fanatics. And so many courageous Catholic men and women have faithfully and courageously witness to the most debated and totally unpopular beliefs, that moral standards are not established by the fiat of the powerful, nor by majority consensus, nor by opinion polls, nor by personal opinion or personal convenience. Courageous Catholics have the humility to say, “we are not gods,” we are rather sons and daughters of God. They profess that morality springs from the divine design implanted and evident in human nature, a design giving humanity stewardship, not total mastery over creation. Exaggerated distortion of independence and autonomy is the temptation which brought original ruin to humankind, and still does. The three temptations narrated in the gospels of Matthew and Luke (though in a slightly different sequence) are three manifestations of the same mother of all temptations – to be ‘like gods’. As opposed to doing the will of the Father, Satan tempts Jesus to follow his own path and way. The devil tries to make Jesus believe the fallacy that the end justifies the means. The first temptation seems harmless enough - to make bread. It was the temptation of too much self reliance, the temptation that posits our belief that we are capable of manufacturing our own salvation through some socio-economic or political solution. The second temptation is the temptation for the spectacular and the sensational, seeking a sign, expecting God to do something special, telling him to do it my way. And finally, the third temptation is the temptation of naked power, it is taking the short cut to salvation, minus the inconvenience of the cross, and thus cancelling the need for genuine conversion. Today it is not fashionable to speak of the devil, much less to believe in him. Screwtape, C. S. Lewis’ letter-writing devil, makes a big point of how advantageous it is for the lowerarchy of devils to be considered a pious myth. It is often said that the greatest trick the devil ever pulled was to convince the world that he does not exist. The story of Jesus’ temptations warns us that the devil is not a myth. Still, we can’t blame the devil for all temptation though surely he is behind much of it. Catholic Tradition lists the world, the flesh and the devil as the sources of temptation. In an age where it seems vogue to advocate pacificism, acceptance, and tolerance, we must make no mistake that there is no parlaying when it comes to the Devil. We are truly engaged in a spiritual battle and there should be no denial of this. We can either choose to stand within the ranks of God, acknowledge his authority and be counted among the free, or continue to assert our autonomy, and unknowingly become the Devil’s slave.